Ok Mark, be cool. This is totally a Soulja Boy reference. The artwork even has stacks of money flying everywhere. Don't start talking protocol stacks or data structures, LIFO, FIFO for your life. Oh. Wait, crap, I just did exactly what I wasn't supposed to, didn't I? I'm the worst. Quick, change the subject! Beer, we're supposed to be talking about beer! So I was just talking about the recent-ish emergence of great brewing in NYC, and Other Half is certainly on that list, lining up NYCers for blocks on end to get a taste of their Northeast IPA flare. I had the good fortune to sample a few of their brews at ACBF last year, and a friend generously gifted me this can, a lovely little Northeast DIPA number made with Citra, Mosaic and El Dorado hops. I'll take it! Beer Nerd Details: 8.5% ABV canned (16 ounces). Drank out of a Charente glass on 5/6/16. 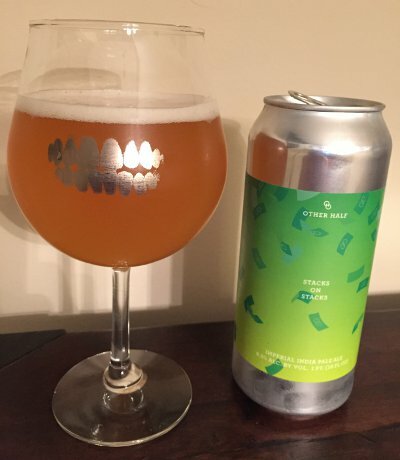 So yes, I need to get me some more Other Half, and you will most certainly be seeing more of them on this blog soon enough. Beer Nerd Details: 18.5% ABV bottled (12 ounce bottle). Drank out of a snifter on 5/1/16. Bottled: March 3, 2016. Production: 783 cases. Never, never, never give up! And I won't, Winston. In fact, I will be seeking out some more in the way of Old Ales in the near future, I think. It will require some hoop jumping though, so wish me luck. New York City has quietly begun to establish itself with some standout breweries. They've always had Brooklyn, and last time I was there, Captain Lawrence was the lone savior on generally tepid taplists, but now places like Other Half and Grimm Artisan Ales popping up, putting out cans of beer that have godforsaken beer dorks lining up for hours. Or wait, where is Grimm from? This label sez it's brewed by Grimm at Beltway Brewing Co, Sterling, VA. Looks like we have another Gypsy on our hands you guys (oops, they call themselves a "Nomadic" brewer, a thousand pardons for not glomming onto the right hipster codeword), and yes, it looks like they're collaborating their arse off as well. Some interesting stuff coming, too. In particular, they brewed a batch of Mosaic hopped Braumeister Pils with Victory (this will hopefully show up around here soon, and I'm most excited to try it) and collaborated with Fantôme on a saison. My kind of Gypsy, is what I'm getting at here. So what we have here is a nice little imperial stout aged in 11 year old bourbon barrels (original batch was aged in Elijah Craig 12 barrels, so mayhaps the new NAS barrels were used for this?) No big whoop. Beer Nerd Details: 10.3% ABV bottled (22 ounce bomber). Drank out of a snifter on 4/22/16. 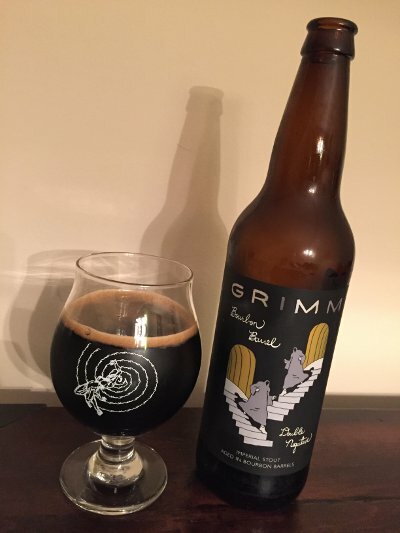 There's also a Maple Bourbon version of this beer which is, you know, sploosh, but I'm pretty on board with the whole Grimm program. I also recently got a taste of their Super Spruce Gose which was very impressive. At this point, I'm definitely seeking out more from these guys. Beer Nerd Details: 5% ABV bottled (375 ml caged and corked). Drank out of a tumbler glass on 4/16/16. Bottled: 02-05-2014. As always, 3 Fonteinen delivers. Alas, no new varieties on the horizon for me... yet. I'm sure I'll find a way to try something else soon enough. I'm looking at you, Framboos. These days, anytime I get a chance to snag a bottle of barrel aged Midnight Sun beer, I jump at the opportunity. 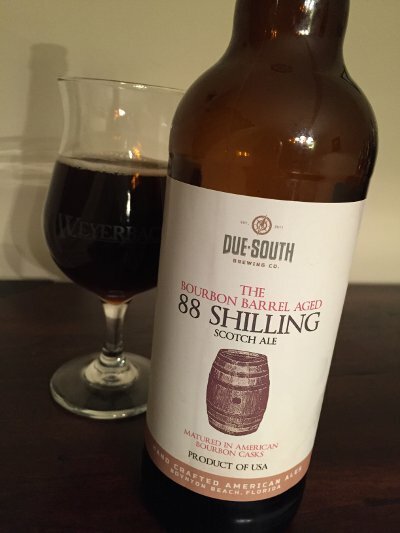 This Belgian Style Barleywine aged in High West bourbon barrels was no exception. Looking into it a little more, it seems like this has a pretty interesting heritage. 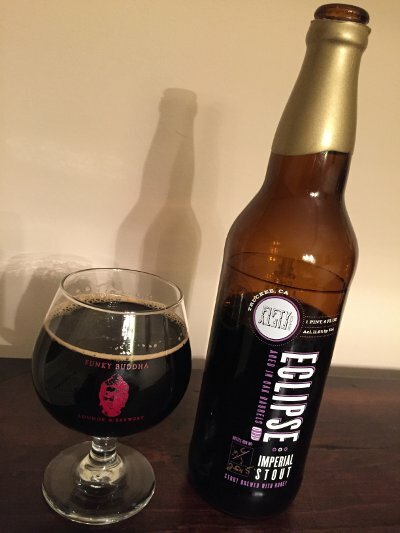 A little over ten years ago, Midnight Sun celebrated their 1000th batch of beer with, you guessed it, a Belgian Style Barleywine aged in bourbon barrels called simply "M" (I knew Roman numerals were good for something). These days, this concept isn't particularly noteworthy. Everyone does this sort of thing. Hell, even I've homebrewed a bourbon oaked barleywine (that I'm positive is drastically inferior to anything produced by Midnight Sun, I'm the worst). But back in 2005? It was apparently a revelation. Bottles of M are among the most prized beers in existence, going for thousands of dollars at auction. Why? Partly it's the rarity, but it is also supposed to be uniquely well suited to aging. Ratings are still sky high, even a decade after bottling. 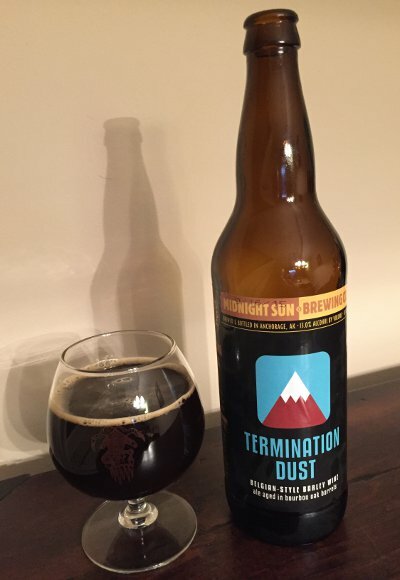 ...As for more M, I'll say that Termination Dust is probably the closest re-creation we have done to date. Fairly similar malt bill, and very similar yeast blend. But again, it's kind one of those "that time, that place" beer. I love making big, dark, barrel aged belgians, stouts, and barley wines. Our Alaskan clientele demands it. As we say, session beers start at 8% up here. Well that's nice to hear! Naturally, this beer doesn't seem to be making the waves that M did, but perhaps in a few years, these bottles will emerge as a wale, bro. Or M was just that ephemeral, one of a kind brew that will never be replicated. Beer Nerd Details: 13% ABV bottled (22 ounce bomber). Drank out of a snifter on 4/15/16. Bottled: 9/16/15. I shall have to track down another bottle of this stuff to age. In the meantime, I'm sure we'll be seeing more from these Alaskan ballers soon enough. You can't read a book about beer without running into the Reinheitsgebot; the fabled German beer purity law that sez only "malt, hops, yeast and water can be used" to make beer. There's something to that, of course, and lots of great beer is made that way. But there is a lot to be had outside the Reinheitsgebot as well. Don't take my word for it, even the Germans recognize certain historical and regional styles that wouldn't fall under the law as beer. Take Gose, traditionally made with salt and spiced with coriander, yet it is covered under and exception. Then again, this particular German Gose is not, because they add Rhubarb to tart things up a bit (and least, that's what I assume, though the bottle I have here sez "German Beer" on the label, so who knows what's going on). Freigeist is the experimental arm of a more traditional brewer, Braustelle. They make all sorts of weird stuff, often in the berliner weiss or Gose mold and usually taking an unconventional approach to even those styles. Their approach seems similar enough to our freewheeling American environment, which I guess explains a fair amount of collaboration in the US, including local Kaedrin compatriots at Teresa's Cafe and Victory. 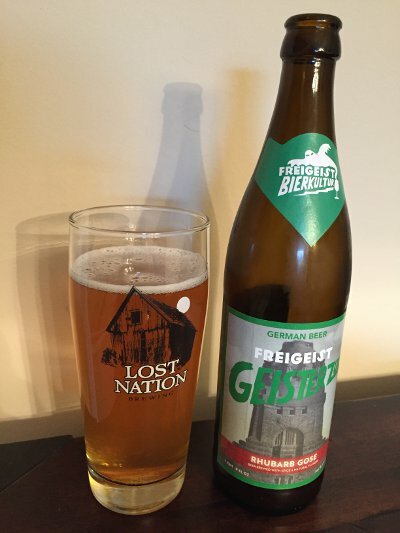 Freigeist translates to "Free Spirit", so I guess they're Dharma to Germany's Greg*, eh? Beer Nerd Details: 5.2% bottled (500 ml). Drank out of a willibecher glass on 4/15/16. * Kaedrin: Come for the beer, stay for the cutting edge cultural references. Vanberg & DeWulf is an importer with a long history of bringing Belgian beer to America, even back in the Dark Ages of U.S. beer in the 1980s. At various times, they handled the likes of Duvel, Rodenbach, and Boon, but those operations eventually outgrew Vanberg & DeWulf's small-scale focus. These days, they're probably best known as the importers of Brasserie Dupont and, for you lambic dorks out there, Geuzestekkerij DeCam. 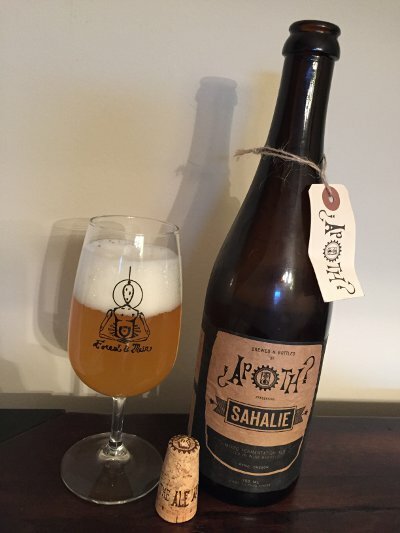 They also seem to have good relationships with Oud Beersel, De Troch, and Boon, sometimes importing one-offs or oddball lines like the Bzart series of champagne/lambic hybrids. I'm not huge into the business side of beer, but one aspect that does interest me a bit is the sort of strange commodity market that has evolved around lambic. This sort of thing seems to happen more often with aged booze, and given the 3 year lead time for a good Gueuze (typically a blend of 1, 2, and 3 year old lambic) it seems to be present in Belgium. Granted, it's probably not as widespread as NDP bourbon and Scotch houses, but there's a few blenderies that don't actually make the beer, but rather just age and blend it. And they're not scrubs either; Tilquin has quickly become a Kaedrin favorite, for instance. This is also how you end up with all those weird mad scientist blends that we've been covering lately. Beer Nerd Details: 6.5% ABV bottled (750 ml caged and corked). Drank out of a flute glass on 4/9/16. Batch 2. Brew Year: 2012. Bottle Year: 2014. Number of Bottles: 9867. Region: Zenne Valley. Source: Private Domain. Barrel Type: 650 liter, Oak and Chestnut. This was good enough that I'd like to snag another sometime and age it, see if that funk blossoms over time. Someday, I'm sure I'll take a flier on regular Lambickx, despite the supposed lack of carbonation. 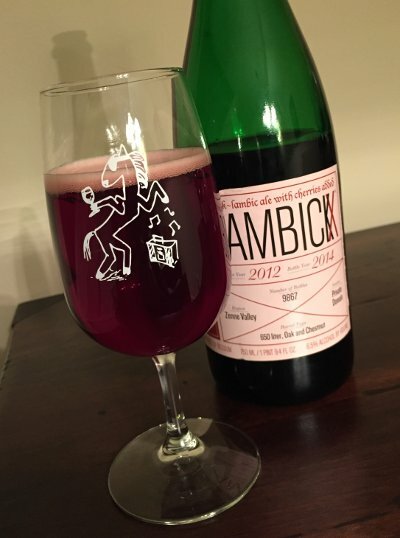 In the meantime, I've got a couple other Kriek lambic reviews coming your way, so stay tuned. Beer Nerd Details: 8% ABV bottled (22 ounce bomber). 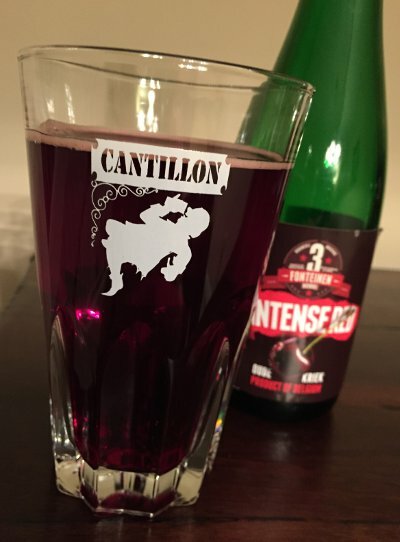 Drank out of a tulip glass on 4/8/16. I've reviewed, like, a kajillion variants of FiftyFifty's venerable Eclipse series of barrel aged stouts, and at this point, it's like, what else is there to talk about? Last year I held a horizontal tasting of 6 variants and also tried the Four Roses variant side by side with the Bourbon, where do I go from there? There are plenty of variants that I haven't tried, for sure, but at some point these posts have to have diminishing returns, right? You hate these posts, right? 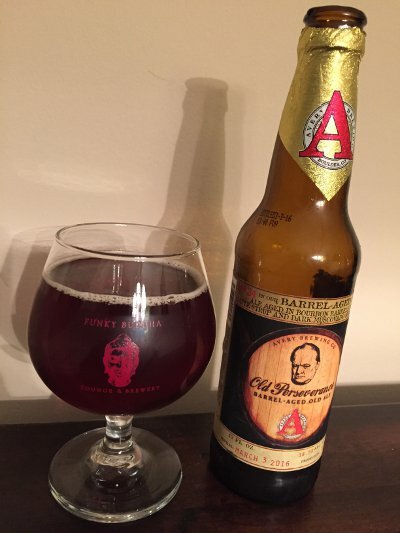 Beer Nerd Details: 11.9% ABV bottled (22 ounce waxed cap). Drank out of a snifter on 4/2/16. Vintage: 2015. Bottle Run No. GC/1.